Nestled amongst tea plantation and hills of Kotagiri, Tea Nest Nightingale is picture perfect, quaint and most certainly romantic. Go on and plan that weekend getaway with bae! 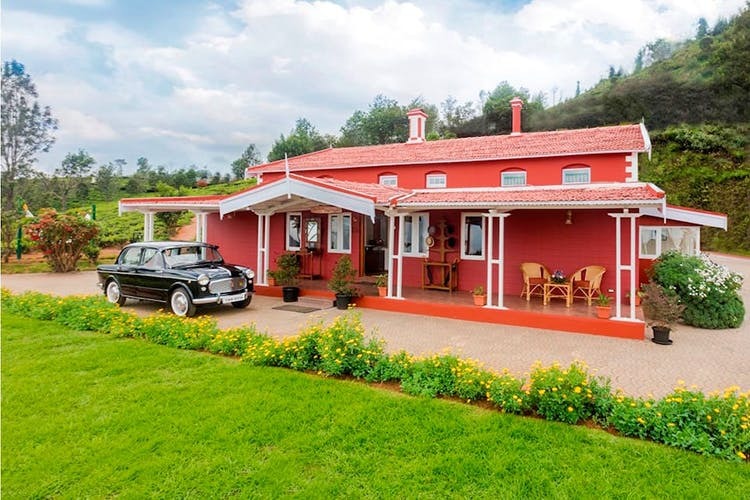 Picture a vast expanse of greens courtesy the tea gardens amidst hills and smack in the centre of it, this gorgeous and quaint looking colonial-style red and white bungalow. A lush green garden, a hammock, and unending views of Kotagiri hills are added bonuses. That’s Tea Nest Nightingale for you, a bed & breakfast homestay that’s away from the noise of the city and offers you a slice of slow-paced life for you to enjoy with bae. Oh yes, as beautiful as it looks, the whole space is as cosy as it can get with minimally furnished rooms with all the modern trappings of WiFi, TV, and complimentary breakfast. Each room named is named after birds. Pick from Carlet Minivet and Hoopoe which are duplex rooms with double beds. Perfect for a family of four to check into, the loft room can be the kids’ room with a sit out for some quality game nights. Couples, check in to either Emerald Dove or Magpie Robin which also comes with a sit out that looks out to the Blue Mountains and the tea plantations. Oh, each room comes with a framed picture of the namesake bird, so be sure to take a hard look at it and see if you can spot them when you are out exploring. Come morning, have your tea or coffee out by the porch or in the lawn. If you get up a bit early even if it means asking for too much on your vacation, you can see the sunrise. It’s worth it. Once you have tucked into your complimentary breakfast, the whole space is for you to explore. You could pass your morning chilling on the hammock and soaking in the sun and reading your book. Or you could play board games such as Ludo or chess to pass time. If that sounds too boring, take up badminton or tennis, both amongst pristine nature and for additional charges. But we recommend you hit the great outdoors. There’s tea plantation walks and Kookkal Blue Mountain Vineyard for you to take up. The vineyard visit is something you can suggest to your SO for extra brownie points as it comes with wine pairing and tasting with covertures chocolates and tea blends. There are kiosks at the vineyard to pick up vinotherapy skin care products made exclusively with Kookkal grapes. There’s also an art gallery that features curated display of rare South East Asian art and artefacts. Do note that the vineyard tour is available only during harvest — December to January and May to June and come at additional charges. One of the rooms, Emerald Dove is available to book on Airbnb for INR 4,498 per night for two people. You can book the room here. For rest of the space, you can check their website here.